The optimal timing of pneumatic lower limb tourniquet application during primary elective total knee arthroplasty surgery (TKA) is a matter of debate. Most previous reports have failed to show significant differences between different tourniquet timings. 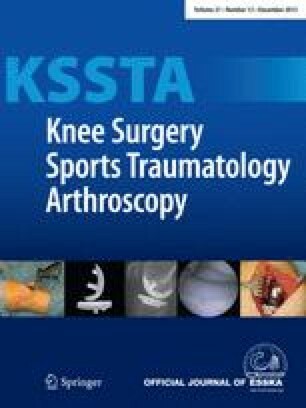 The aim of the work was to determine how three strategies of lower limb pneumatic tourniquet application affect the outcome for TKA patients. Forty-three patients who undergo TKA were randomized into one of the three groups, and 36 of these patients completed the study. The tourniquet was inflated just before incision and deflated after the hardening of the cement for twelve patients (Group 1), it was inflated just before cement application and deflated after its hardening for another twelve patients (Group 2), and it was inflated before incision and deflated after the last suture of the skin for a further twelve patients (Group 3). Fit-to-discharge criteria and six methods for calculating estimated blood loss were used. The estimated blood loss in Group 1 was lower than in Group 2, as determined by six methods of calculation (p < 0.05). Estimated blood loss in Group 3 was lower than in Group 2, as determined by one method (p = 0.050). The mobilization performance in Group 1 was better than in Group 2 (p = 0.023) and in Group 3 (p = 0.033). Group 1 was better fit to discharge than Group 3 (p = 0.030). Inflation of an automatic pneumatic lower limb tourniquet before skin incision and its deflation after hardening of cement tends to give better outcomes in TKA patients during six postoperative days. The estimated blood loss was highest when the tourniquet was inflated just before cement application and deflated after its hardening. Part of the results disclosed here were presented at the 5th International Baltic Congress of Anaesthesiology and Intensive Care in Tartu, Estonia, 21–23 October 2010, the 3rd World Congress of TIVA-TCI in Singapore, 31 March–2 April 2011, the Annual Meeting of International Anesthesia Research Society in Vancouver, Canada, 21–23 May 2011, 4th International Conference on Drug Discovery and Therapy in Dubai, JAE, 12–15 February 2012, 15th WFSA World Congress of Anaesthesiologists in Buenos Aires, Argentina, 25–30 March 2012. The project was supported by an ESA Research Grant 2009.
where BV is the normal BV calculated by Nadler’s formula. where BV is the normal BV calculated by the formula recommended by the International Council for Standardization in Haematology. where BV is the normal BV calculated by the formula recommended by the International Council for Standardization in Haematology.Hb i initial Hb, Hb f final Hb, Hct i initial Hct, Hct f final Hct, Hct m mean Hct. where BV is the normal blood volume, PV is the normal plasma volume, RCV is the normal red cell volume, BSA is the body surface area in m2, W is the body weight in kilograms, and H is the body height in cm. where BSA is the body surface area in m2, W is the body weight in kilograms, and H is the body height in cm. where RCL is the estimated loss of red blood cells, and BV is the estimated normal blood volume (see Formulae 4 and 5).